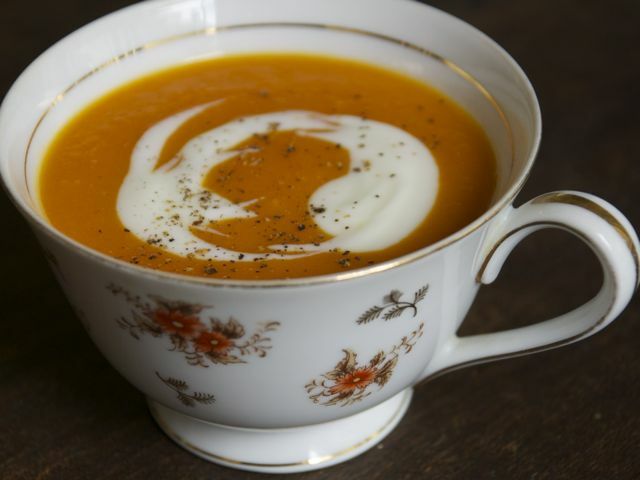 Last year, when I made Amy Pennington's Carrot-Coconut Milk Soup soup, I liked it, but couldn't stop tinkering with it. First I added ginger and swapped out the coconut milk for "lite" coconut milk. Very good, but I wanted more carrot flavor and to bring forward the wonderful caramelized-shallot flavor, so I added more of both ingredients. Sweet potatoes, I thought, would add a luscious texture to the soup, so I included those in my next pot of soup. Then I started fooling around with the garnishes, adding a pinch of salt and a bit of orange zest (maybe lime next time?) to the yogurt, thinning it with a bit of milk to make it easy to drizzle. An elegant first course, a nice companion to Asian-flavored noodles and green salads, and a pleasing lunch served all on its own, this is now my all-time favorite recipe for carrot soup. Make the soup: In a medium pot, heat the olive oil over medium heat. Add the sliced shallots and a pinch of salt; cook about 2 minutes, stirring often. Add the carrots and stir occasionally, letting them sit and brown a bit (the shallot will start caramelizing too), about 8 to 10 minutes. Stir in the sweet potato and ginger and cook another 5 minutes, stirring here and there. Add the coconut milk and vegetable broth (or water) to the pot, bring to a gentle boil, then reduce the heat. Simmer, partially covered, until the carrots and sweet potato are soft and cooked through, about 20 minutes. Turn off the heat. Purée with an immersion blender until completely smooth, or carefully in a blender (remember to leave several inches of headspace at the top of the blender, and cover the lid with a thick dishcloth to absorb any accidental hot splatters). Stir in more water if you want a thinner soup, and season to taste with salt. Reheat if necessary. Serve hot as is, or garnish with a spoonful of plain yogurt or optional seasoned yogurt (see below) and freshly ground black pepper. Make the garnish: Whisk together the yogurt, orange zest, and salt. Thin, if you wish, with a little milk or cream.